"Toy: Dream Doll - 2" by Normadeane Armstrong Ph.D, A.N.P. This is a Nurse themed children's doll produced by Elite Creations as part of their Dream Doll line. According to the box the doll was made in the U.S.A., is dressed as a nurse, and is labeled "Cat. B-20." 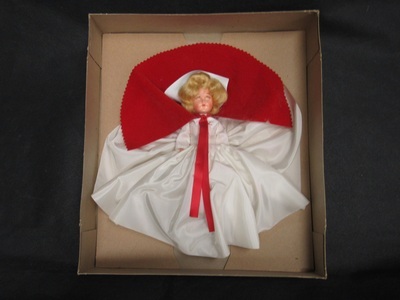 The eyes of this doll close as the doll is laid on its back and open when stood it is in the standing position. The measurement listed is the measurement of the box. All measurements were taken in centimeters. Measurements are listed as “length by width by height” or “height by diameter” unless otherwise noted.